TAHOE/TRUCKEE, Calif. – The warnings were certainly ominous – an extended period of torrential rain, high elevation snow levels, and potentially major flooding on the Truckee River. Classic ingredients for what meteorologists call a “wet mantle” flood event, when heavy rain washes out an existing snowpack and overwhelms the watershed and streams and rivers breach their banks. Yes, it seemed the components that can cause damaging floods were there (except for an established low elevation snowpack), but as it turned out the final surge of moisture turned to snow over much of the higher elevations which slowed snowmelt considerably. Residents living within the Truckee River flood plain between Squaw Creek and Donner Creek dodged a bullet this time, but that’s not to say their homes aren’t at risk. Those five days of rain and snow definitely had the potential to fulfill all the National Weather Service warnings for the Tahoe-Truckee watershed, but luckily the region was spared serious damage. In fact, we picked up a boatload of moisture and ski resorts are loving the 2 to 4 feet of fresh snow that blasted the upper elevations. In a reversal of the normal situation where Sierra Crest-based resorts usually receive the most snowfall, Northstar California reported the greatest storm total with 47 inches on the upper mountain. Accumulations near lake level were measly. Consider that Squaw Valley picked up 42 inches of snow at 8,200 feet, but only 2 inches at the base. However, virtually all the major resorts are in fairly good shape for the economically vital holiday season that’s only weeks away. If the Storm King doesn’t do it, when cold air arrives snowmaking will beef up the thin snowpack at resort bases. The recent stormy period definitely put the region on course for an above average 2013 water year. Although no records were broken, rainfall totals were impressive: Donner Lake picked up about 11 inches; Blue Canyon more than 14 inches; and La Porte, north of Truckee, was doused with nearly 18 inches. Brandy Creek, elevation 1,300 feet on the Upper Sacramento River drainage was the wettest spot in California with nearly 2 feet of rain. The NWS dubbed the persistent flow of Pacific moisture an “atmospheric river,” an apt term to describe the amount of water that poured down on the north state. Seasonal precipitation totals in the Sierra were boosted significantly, with the Northern Sierra 8 Station Index currently averaging 218 percent of normal. (The index represents the aggregate of eight sites ranging from Highway 50 to Mt. Shasta.) As of Dec. 4, 2012, water year 2013 is off to a roaring start, better precipitation-wise than the snowbound winter of 2011, and even ahead of the pace of 1983, the wettest winter since the index was established in 1922. The Truckee River flood warning was issued when the NWS expected freezing levels near 9,000 feet, accompanied by heavy rain that would come rushing out of watersheds west of Highway 89, including Squaw Valley and Alpine Meadows. Forecasters predicted conditions akin to what occurred in late December 1955 during a similar hydrological event. It was called the “Storm of the Century.” For 10 days during Christmas season 1955, a series of storms from Hawaii poured wet snow and rain on the Sierra and Northern Nevada. 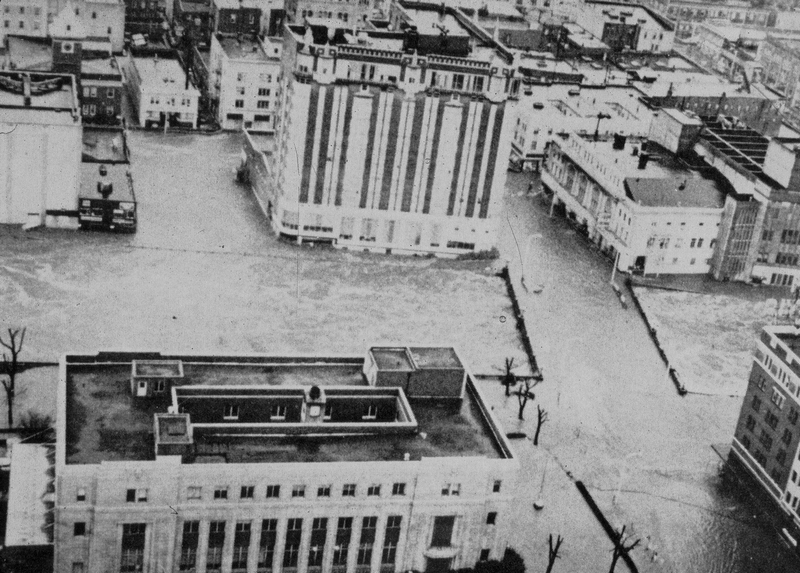 Officials said there was no cause for alarm, but Reno, Nev. business people remembered the 1950 Thanksgiving flood that heavily damaged the city and they swung into action. Volunteers and National Guardsmen stacked walls of sandbags along the riverbank and in store entrances. Contractors supplied cranes to clear logjams and debris in the Truckee River. Parking meters were removed from downtown bridges. Sure enough, two days before Christmas more than 2 inches of rain pounded Reno in 24 hours. (Reno picked up only 1.34 inches of rain in the recent five-day event.) Upstream, nearly every power plant and bridge on the Truckee River was destroyed. Wet snow pulled down power lines, severing communication between Western Nevada and California. Logs jammed against bridge supports, and 4 feet of water flowed into Reno’s downtown district. Many residents fled, although not before hanging their gifts high in their Christmas trees. At Stead Air Force Base, holiday furloughs were canceled, and hundreds of airmen with radios, jeeps, and trucks joined National Guard troops in sandbagging and policing the streets. Finally, on Christmas Eve, cold air from the Gulf of Alaska turned the rain to snow, and the river began to recede. Overnight the swirling flakes descended on Reno’s flood-ravaged streets, covering the debris with a mantle of snow. Reno residents awoke to their first white Christmas in years. 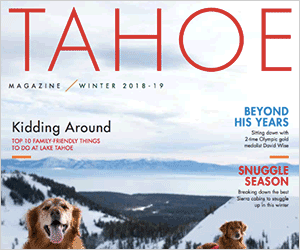 – Tahoe historian Mark McLaughlin is a nationally published author and professional speaker. His award-winning books are available at local stores or at http://www.thestormking.com. You can reach him at mark@thestormking.com. Check out Mark’s new blog at http://www.tahoenuggets.com.